Hotel Neapolis is a three stars hotel situated in the heart of the historical centre of Naples, at walking distance from the city’s most ancient and evocative monuments. Furthermore, the hotel is connected with other places of great interest by the metro, bus and funicular lines, whose stops are few metres distant from the hotel. For this reason, the Neapolis is the ideal residence for who wants to get to know Naples as a city of art and culture. The hotel has 24 rooms (single and double), some of which are used as triple and quadruple rooms. Every room is equipped with bath, independent adjustable air-conditioning system with remote control, TV SAT independent self-adjusting broadcasting, fridge-bar, PC with flat screen and free internet connection, direct dial telephone. The hotel has moreover comfortable and pleasant rooms for breakfast, TV, bar, restaurant and a monumental complex (church and chapels) for organizing conferences, congresses, exhibitions, shows and any other type of cultural event. The roof bar “Le terrazze” is a splendid solarium during the day, and in the evening it becomes a marvellous place for enjoying a drink in the moonlight. Last but not least, the hotel has a garage which is very important: it is extremely difficult to find a parking space in the historical centre. The Neapolis offers its guests a garage with collect-and-return service directly to the hotel entrance. All rooms are finely furnished and have a private bath (hairdryer, soaps etc. ), air conditioning, satellite TV, radio, direct dial telephone, minibar and PC with free internet connection. There is also a room for disabled people, a breakfast room and a TV room. The Neapolis has been defined the first internet hotel in Italy because, besides the traditional service offered to the guests, it has a PC in every room with free internet connection. Every guest can use internet and email, but also connect to the institutional websites in order to get any kind of information about events organized in the city, monuments and much more. Tourist information is available also on the Neapolis TV channel which broadcasts videos and documentaries about the city, as well as Neapolitan songs. In the hotel hall, the reception staff can also suggest itineraries and visits through photos, books, websites and TV channels. All rooms are finely furnished and have a private bath (hairdryer, soaps etc. ), air conditioning, satellite TV, radio, direct dial telephone, minibar and PC with free internet connection. There is also a room for disabled people, a breakfast room and a TV room. The Neapolis has been defined the first internet hotel in Italy because, besides the traditional service offered to the guests, it has a PC in every room with free internet connection. Every guest can use internet and email, but also connect to the institutional websites in order to get any kind of information about events organized in the city, monuments and much more. Tourist information is available also on the Neapolis TV channel which broadcasts videos and documentaries about the city, as well as Neapolitan songs. In the hotel hall, the reception staff can also suggest itineraries and visits through photos, books, websites and TV channels. The hotel is located in the historical centre, near all important sights and locations. It is also well connected to public transport, but it is not directly near the hectic and noisy central station. Guests need to communicate their credit card data as a guarantee. Reservation can be cancelled without penalty until 48 hrs before 0.00 of arrival day. In case of late cancellation or no-show, the cost of the first night in all booked rooms will be charged to the credit card. 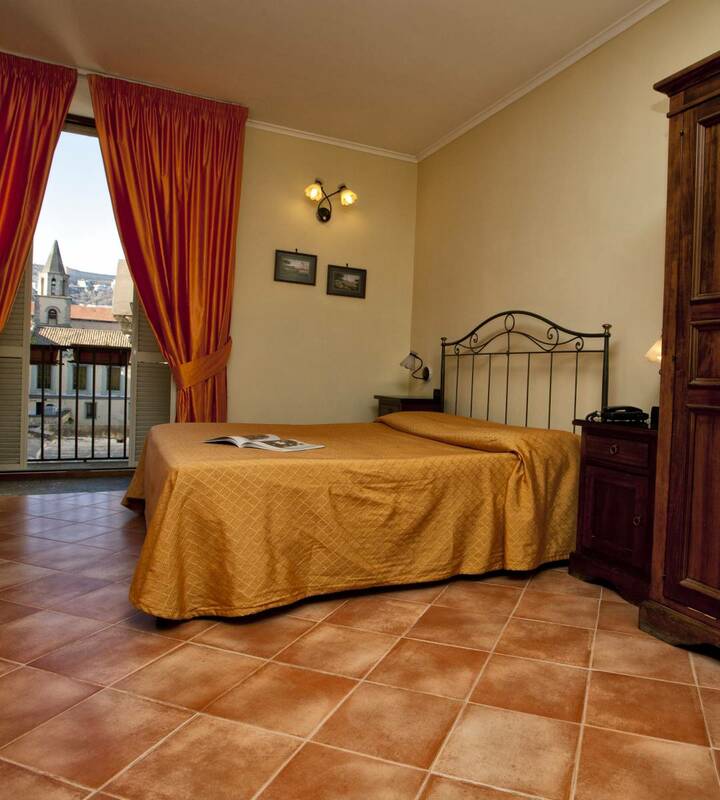 The hotel is located in Via Francesco del Giudice 13, at the crossroads with Piazzetta Pietrasanta and Via Tribunali, one of the main streets of the historical centre. By Bus from Airport: By ALIBUS to the central station. From here, take the bus R2 to PIAZZA BOVIO, then stop here and take the bus R1 or R4 to PIAZZA DANTE. Stop in PIAZZA DANTE and continue on foot. By taxi: it takes about half an hour and costs about 30 euros. By car from airport: : follow VIALE MADDALENA (direction: CENTRO) to PIAZZA CARLO III, then continue through VIA FORIA to PIAZZA CAVOUR and then to PIAZZA MUSEO. Here turn left and then take the first on the left. At the traffic lights turn left, then right, go up and continue along the Hospital POLICLINICO VECCHIO and VIA DEL SOLE. At the end turn left: the Hotel is close to the Pietrasanta bell tower. By car from the station: Through Corso Umberto along the University. After the university turn right and go up VIA MEZZOCANNONE. Arrived at PIAZZA SAN DOMENICO MAGGIORE turn right and then left. Then the second side-road on the left and then again right: you are in front of the Pietrasanta bell tower.